A couple days ago, we got a sneak peak at the Crossover x Puma Blaze Of Glory Velvet Twin Pack, today we get even more images of the collaboration between Malaysia’s Crossover and Puma. The shoe we’re focusing on today is once again the “Rose” Blaze of Glory. The hoe draws inspiration from the dark and satirical drama of films that are loved by Crosover founder, Jem. The shoe comes dressed in a grey mesh base complimented by he nubuck upper. Additional features on the shoe include the speckled cage and overlay. Adding some color to the shoe is the Pink detailing, which is also known as being Crossover’s signature color. Sky Blue and teal hits throughout the shoe complete the main features on the shoe. The Crossover x Puma Blaze of Glory ?Rose? is currently available at Crossover stores and will also be releasing at other global retailers on April 23. It looks pretty clean. The vibrant/bold look will look great during the current season. Great work. The post Another Look At The Crossover x Puma Blaze Of Glory Velvet Twin Pack appeared first on KicksOnFire.com. This Crossover x Puma Blaze of Glory Roses consists as a collaboration between Malaysia?s premiere sneaker retailer and the popular sportswear brand. Taking inspiration from the dark and satirical drama found in films beloved by the sneaker retailer’s founder, Jem — this reinterpretation of the runner sports a tonal grey upper comprised of mesh, nubuck and leather. Detailed with speckling on its caged overlays, the retailers’s signature colors are evidenced with hits of pink on the tongue, laces and sole, while a hint of sky blue on the insole and around the tongue provide subtle freshness. Finished off with a rose stencil print near the heel, you can purchase a pair at select Puma retailers worldwide starting April 23. I like the silhouette in general. This collab is a nice execution. The colorway and how it’s placed is pleasing. The post The Crossover x Puma Blaze of Glory Roses Is Releasing Soon appeared first on KicksOnFire.com. As part of a Flag pack, the Puma Blaze Of Glory in bright red is showcased in particular, as the model is now available at select retailers. Sporting a premium composition made up of soft suede, the sneaker is essentially defined by its eye-catching hue. Tonal overlays that comprise its design such as the lacing system offer reinforcement, while bold stitching can be seen along its tongue and collar section. Further detailed with rounded laces and a lace lock for adjustability, the model rests atop a matching Trinomic sole unit. You can purchase a pair at select Puma retailers now. I’m a fan of runners in general. The makeup on this is solid but I’m just biased towards the colorway. If you’re looking for something bright, this is a good choice. The post A Cherry Red Puma Blaze Of Glory appeared first on KicksOnFire.com. The Crossover x Puma Blaze Of Glory Velvet Twin Pack is the latest collaboration coming out of Puma. A two-pair pack, today we take a look at one of the shoes that make up the collaboration. Puma teams up with Crossover, a small sneaker boutique in Johor Bahru, Johor, Malaysia to create a shoe that is said to be inspired by the stereotypical view of suburban Americana. What does a shoe like that look like you ask? Well, in the minds of Malaysia’s Crossover, suburban Americana consists of white picket fences, a clear blue sky, perpetual optimism and a parade of roses. Crossover feels they were able to transcend that look onto the appearance of the shoe. The shoe comes in a grey base, a speckled overlay, hits of teal and pink and a predominantly white midsole. Crossover branding is spotted on the tongue, while Puma branding can be seen on the heel and tongue. Set to release on April 23rd, let us know what you think about the shoe. Very colorful looking shoe. I like it. I think the Blaze of Glory looks best when lots of colors are utilized on it. The post Our First Look At One Half Of The Crossover x Puma Blaze Of Glory Velvet Twin Pack appeared first on KicksOnFire.com. The PUMA Suede gets another wild makeover this spring, featuring metallic splatter across the upper. The ubiquitous sneaker from PUMA gets adorned with an all-over splatter of silver across its black suede base, giving the tried and true silhouette a whole new look once again. If you dare to wear the bold colorway, pick up the “Metallic Splatter” Suede now at select PUMA retailers like Rock City Kicks. 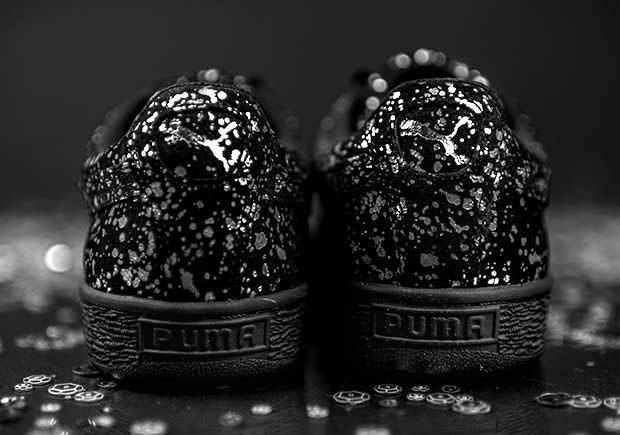 The post Puma Suede “Metallic Splatter” appeared first on Sneaker News. German lifestyle specialists Puma have upgraded one of their most iconic 90s retro runners for a monochromatic trio known as the “Soft Flag” Pack for Spring 2016. The Puma Blaze of Glory fits in with today’s sneaker landscape perfectly thanks to a slip-on upper, unique lacing system, and a Trinomic outsole unit that only seems to get better with age. A Barbados cherry red, black, and ivory all land on the BOG’s synthetic suede upper while contrast stitching helps add some depth to each pair. The respective outsoles even feature a bold confetti sprinkle print for a nice touch. What do you think of the Puma Blaze of Glory “Soft Flag” Pack? Check out more detailed shots below and pick up your pair today from international retailers. The post Puma Blaze Of Glory “Soft Flag” Pack appeared first on Sneaker News. Puma has teamed up with Crossover, a small sneaker boutique in Johor Bahru, Johor, Malaysia for the new “Velvet Twin Pack”. The Puma Blaze of Glory is the first release in the ongoing collaboration and is inspired by the stereotypical view of suburban Americana. White picket fences, a clear blue, sky, perpetual optimism and roses are satirically referenced through a grey mesh base, speckling throughout, and dashes of teal and pink. Crossover’s signature skull logo is featured prominently on the tongue. Check out a detailed look at the collaboration below and know that international retailers will be stocking this pair on April 23rd. 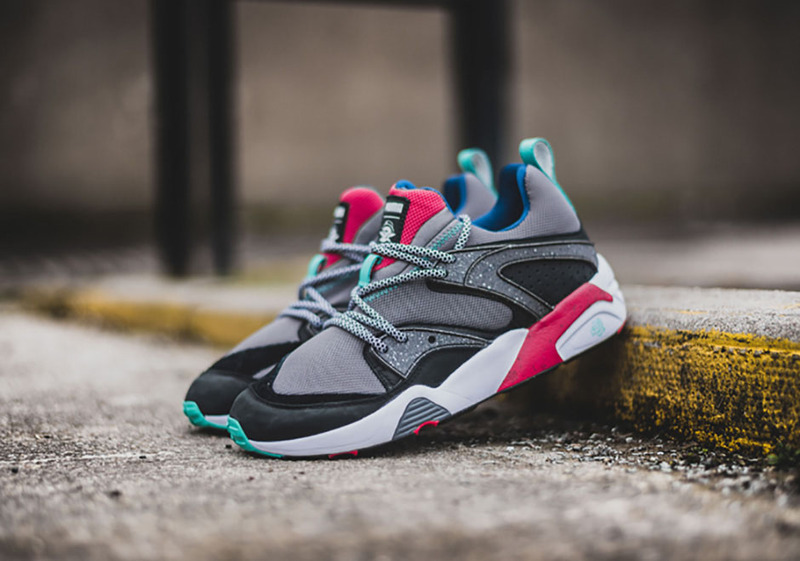 The post The Puma Blaze of Glory Teams Up With Malaysian Retailer Crossover appeared first on Sneaker News. Puma recently dropped several different iterations of the Puma Blaze Of Glory. Two of the versions that managed to stand out were the ones constructed out of suede, one for men,the other for women. Let’s take a closer look. The men’s pair comes dressed in a tonal grey suede upper with neoprene construction used for the bootie part of the shoe. The all grey upper blends in nicely with the all-white sole unit of the shoe. The women’s pair opts to come in an all-pink aesthetic while also utilizing the same construction. Just like the men’s pair, the women’s version also comes contrasted by an all-white sole unit. Retailers worldwide such as BSTN should already have these in stock. You can pick up the Men’s/Grey pair here and the Women’s/Pink pair here. I like the minimal look on the shoe, and the fact that it?s constructed out of suede makes me like it even more. I?ve never owned a pair of the Blaze of Glory, but one of these could very well be my first pick up. 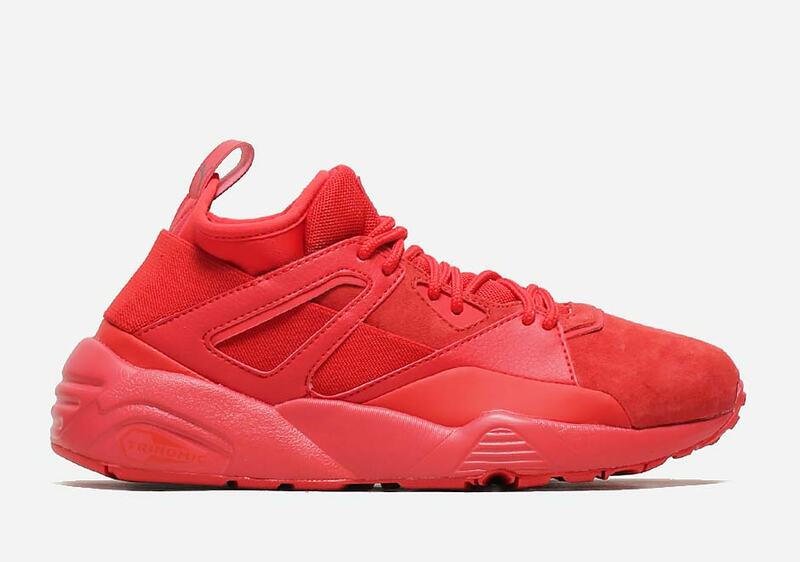 The post The Men And Women Have New Puma Blaze Of Glory Colorways To Choose From appeared first on KicksOnFire.com. The PUMA Suede Classic is the definition of a classic (pun intended). The timeless silhouette has been done up in countless colorways and materials that there is so many options to choose from. One of the latest colorways to drop is this Splatter Metallic pair that you see above. Coming dressed in a full black suede upper, metallic silver splattering engulfs pretty much the entire shoe with the exception of the midsole, inner liner and laces. The PUMA Suede branding on the side panels has also been done in metallic silver. You can find the Metallic Silver colorway of the PUMA Suede Classic at select PUMA retailers now for just $70. The PUMA Suede Classic is always a silhouette that I’ve admired form afar. Much like other classic sneakers, I think the simpler it is the better. This Metallic Silver splatter colorway just has a little too much going on for my taste. The post This Splatter Metallic Colorway Of The PUMA Suede Classic Is Flashy appeared first on KicksOnFire.com. After releasing the Rihanna x PUMA Creeper and the Rihanna x PUMA Fenty Trainer, the international pop star will now be releasing a different type of footwear. Rihanna is set to release her first slide/sandal with PUMA which draws inspiration from the PUMA Leadcat soccer boot. Pictured in the image above, this new Rihanna x PUMA Slide features a furry upper with the PUMA branding on it. The only downside is that they’ll retail for $80. DO you feel comfortable paying $80 for some slides? Not even Jordan slides cost that much. The new slide between Rihanna and PUMA is set to launch on April 22nd. $80 for some slides? I don’t know what both PUMA and Rihanna were thinking. They look like regular PUMA slides to me. That furry upper just makes them look cheap in my opinion. I wonder if these will still sell out even with the cray price tag. The post Rihanna Will Be Releasing Slides With PUMA, But They Won’t Be Cheap appeared first on KicksOnFire.com. Puma heads, you might want to take a look at these, these are pretty serious! Recently released, let’s take a closer look at the Puma Suede Mid Embossed Pack. Consisting of two tonal offerings, the Suede Mid comes in either Arabian Spice or Pale Khaki. Both pairs will feature a full premium suede upper accompanied by the matching embossed Puma stripe in the side panels. Contrasting Puma branding appears on the lateral side, while the tonal laced tie up the look of the upper together. Finishing off the look of the shoe is the gum rubber outsole placed under the base of the shoe. Available now, pick up your pair at select retailers for $80. The Arabian Spice colorway looks amazing, and you really can’t beat the price either. Although I see these more as Fall/Winter sneakers, I just may need to pick up a pair and bust them out at the end of 2016. The post Don’t Sleep On The Puma Suede Mid Embossed Pack appeared first on KicksOnFire.com. PUMA gives the Blaze of Glory some tweaks for an updated, stylish new look dubbed the Blaze of Glory Sock Core. Giving the classic model an on-trend redesign, the Blaze of Glory Sock Core seems to take some inspiration from models like the Nike Sock Dart, adidas NMD, and maybe even the Y-3 line for its sleeker, sock-like upper constructed in suede and neoprene with leather detailing. The trendy silhouette also receives the trendiest color treatment: tonal versions in red, white, and black. Find the Blaze of Glory Sock Core arriving at finer PUMA stockists now. The post PUMA Transforms The Blaze Of Glory Into A Sock-Like Sneaker appeared first on Sneaker News. The Puma Blaze Of Glory Sock Core is one of the newest renditions stemming from the Blaze of Glory. Right off the bat you can tell that this version is much more “chunkier” than the original version. If you like that kind of look, you’re probably going to like this particular model. Coming in three tonal colorways, the shoe’s upper will don a tonal cream, black or red motif. The shoe will be constructed out of a textile and leather combination complimented by the suede placed on the toebox. Adding chunkiness to the shoe is the enlarged sole unit placed below. Another feature on the shoe is the neoprene sock liner that gives you some added comfort and support. Available now internationally, it’s only a matter of time before we see these stateside. I actually prefer the BOG over this chunkier version. It’s cool, but the original pair looks better in my eyes. Watch: Is The Air Jordan 2 Low Gym Red A Suitable Red October Replacement? The post The Puma Blaze Of Glory Sock Core Will Drop In Three Tonal Colorways appeared first on KicksOnFire.com. Not only are all the uppers done in tonal fashion, each respective color extends all the way to the sole unit of the shoe. There’s more to the pack that the tonal look tough. If you pay close attentions you will notice features such as the contrasting zig-zag stitch work placed on the bootie sock lining and the tongue’s separation lines. Below you will find that the Trinomic midsole hides a semi-translucent multicolored design found on the outsole. A contrasting lace lock gives the shoe some pop to create nice contrast on the upper. Slated to drop next Friday, which pair is your favorite? The Blaze of Glory is definitely one of my favorite Pum models. I may not be picking any of these up, but I definitely see a BOG in my future. The post Three Colors To Choose From On The Puma Blaze Of Glory Flag Pack appeared first on KicksOnFire.com. The Puma Fierce Core is considered Kylie Jenner’s first release with Puma. We got our first look of the shoe a couple of days ago and now w have images that show what the shoe will look like once you lace them up. For those of you who don’t know, the Fierce Core is a women’s exclusive. It also happens to be very similar to the shoe Rihanna recently dropped with Puma, the Rihanna x Puma Fenty Trainer. The shoe comes with a neoprene slip-on construction. It also comes with a laceless design while the mesh overlays provide the shoe some added breathability. As of right now only tonal offerings appear on the shoe, in which all come paired up with an all-white midsole. Thoughts on the shoe once you lace them up? Let us know in the comments below. No doubt in my mind the Rihanna pair looks better. This looks like a knock-off version of the Fenty Trainer. They should have taken more time on designing her first shoe. The post An On-Feet Look At Kylie Jenner?s Puma Fierce Core appeared first on KicksOnFire.com.